My family and I have two Rockin’ KR McNabs, Flash and Torch. We got Flash in 2007 and loved him so much that we came back and got Torch (out of Flash’s sister) in 2010. They are so smart and catch on to things very quickly. Flash is one of the most athletic dogs I’ve ever met. Torch’s intensity, intelligence, and connection has enabled him to become one of the greatest disc dogs ever. Besides being great at athletics, they are very easy to live with. They have what we call an incredible “off switch.” Flash is extremely lazy around the house, but turns it on when it’s time to play. I have several breeds in my home and my Rockin’ KR McNabs are the best behaved at home. My family and I enjoy living with them. No other McNabs have impressed me quite like the Rockin’ KR McNabs. It is with pleasure to write to you today about the experience I have had with Ron Prentice as a breeder. I have come to know Ron Prentice in 2006 when I first learned that my rescue dog Burlington was a McNab. I had never heard about this breed and started the quest of extensive research about the breed, breeders and the lines that are being represented in the U.S.
Every time I started to dig deep, I came across the name Ron Prentice in one form or another; should it be the reputable breeder, top notch champion dogs or gate keeper to the preservation of the integrity of the McNab breed. He is the one that stuck out to me. After contacting Ron and after describing to a “T” what I was looking for in a dog, I was put on a waiting list and received my now 6 year old McNab Gusto. Gusto by far has exceeded my expectations in everything this dog has done in the past 6 years; Flyball, Agility and Frisbee titles as well as an incredible companion and with zero health issues and vices. We have stayed in touch over the years and Ron has cheered us on every step of the way. It is easy to say he is one of our biggest fans. Ron has a deep inner caring for the preservation of the McNab breed. 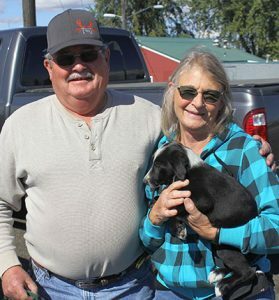 He is extremely knowledgeable about the breed standard and the disposition about each of his dogs and a TRUE CHAMPION to the stock dog community. I have personally inspired family and friends to come to love this breed that he so wholeheartedly preserved and I have heard nothing but positive feedback from each and everyone of them about the dogs they have received. 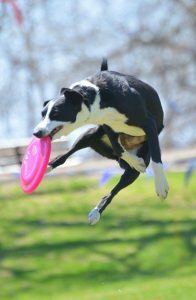 Having successfully competed in Frisbee competitions for over 20 years with Aussies and Border Collies, I never thought I would stray from those breeds but that all changed when I saw my first McNab. I immediately looked over at my wife and said, “my next dog will be a McNab.” When the time came and I was ready to get another dog, I knew I wanted a McNab but I had to do some homework on the breed. I made several calls and one specific person’s name was always mentioned and that was Ron Prentice. I called Ron and introduced myself and discussed with him at length why I wanted a McNab. Ron told me that he would have a litter of pups soon and thought that it would be a good fit. May 14, 2016, the litter of pups were born. 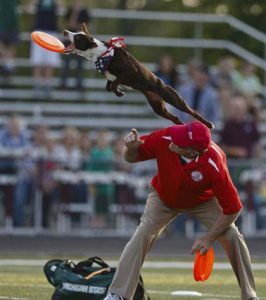 I was ecstatic, I was one step closer to having another Frisbee dog. Due to living in south Florida, I was not able to spend time with the pups to pick one out so I relied on Ron’s expertise. Ron picked out a pup he nicknamed Houdini due to him being so active and always on the go. Needless to say, the name stuck and we officially named him Rockin’ Houdini. 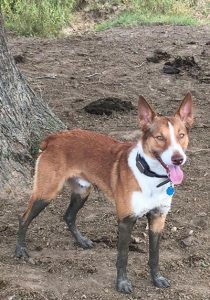 Prior to bringing Houdini home, I knew the McNab breed was both extremely intelligent and athletic but I had no idea how much he would change my life for the better. Houdini is not only intelligent and athletic but he has an amazing personality and ability to adapt to any situation. At 17 months old, he is an amazing Frisbee dog, dock dives, does K9 fitness, is learning nose work, obtained his CGC and will be taking his TDI certification test early next year. While we do not live on a farm, we have taken him several times to a farm to heard sheep and it is amazing to be able to his natural instincts and ability kick in. Thank you Ron for entrusting me with one of your amazing pups. I look forward to being able to do great things with him. Houdini is my first McNab but definitely will not be my last. Buck was brought to us by Rockin’ KR McNabs Ron Prentice at 8 weeks and he has been a joy since. 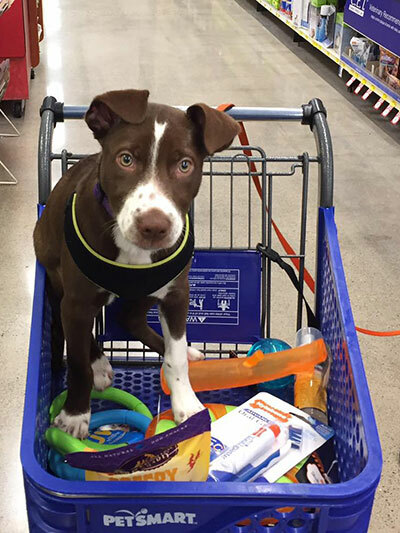 This pup by Kye and Bree has given us even more than we expected. Rockin’ KR McNabs dogs are amazingly smart. He has been working cattle and gets smarter every day. Rockin’ KR McNabs has always surpassed his promises with customers by delivering healthy, happy, pups that have had much human interaction. Buck has not only herded cattle and chickens but has filled our hearts with an amazing personality while I have battled cancer. During the time I was unable to help Randy this pup has been a Godsend filling that spot where I was missing in the cattle lot as well as soothing our hearts. In the meantime Rockin’ KR McNabs Ron Prentice has became a personal special friend that we can always rely on. You won’t go wrong buying one of Rockin’ KR McNabs’ pups but must be willing to commit to training and activity to do these pups justice to reach their potential. Rockin’ KR McNabs will give you all the background support you need. I must say I am impressed with your breeding program. When I first talked to you I asked for a pup with high drive, no fear and lots of speed with great jumping ability I didn’t want a dog that was dog aggressive yet very protective of family and kids and great with children. You said the training had to come from me but promised she would have the natural ability. Your so modest. No lie, She (Rally) took me to my limits as a trainer. I had heading dogs on the farm never ran into a header and a heeler before. She is smart picks most stuff up right away.has a vocabulary of a 4-year old kid as far as commands a little head strong to say the least! When it comes to working she is all business. She is a “Throw Back” McNab weighing around 29-pounds, would run thru a fire to catch a Frisbee if I asked her too. Loves kids and plays well with all dogs. She loves to herd as she is always rounding up the pack I train. But, this is one thing that blew my mind about her. She was raising a ruckus in the back so I went outside and put her in the basement of my house. She was giving that protective bark like something was wrong but I didn’t see anything. so I go inside and she charged up stair and blew threw a screen slider ran down some steps and tore into a wild Pit Bull that had came in the from the corn field. She cut that Pit Bull off from a puppy and a child on the side of the yard. and had him on his back by the time I got back down the steps. The Pit ran off and oh Rally was DE gloved on her lower jaw. After three surgeries and having her jaw wired shut for six weeks she came out of it in top form. Did a show at the Breslin Basketball court at Michigan State University on December 9th 2017 three months after she saved that puppy and child and she then brought the Entire House Down. Now that is McNab tough! She loves strawberry smoothie’s after I had to feed her thru a straw for six weeks. Now Panda my newest pup is one year old now, She is obedient to a fault. Never had a pup listen so well. Great with kids. and jumps like a kangaroo, eight feet is no problem. she handles routines well quarters well and is also a header and a heeler. She works well with one the other McNabs I got from a friend of yours and is rounding out into a great performer. She is a standard. size running around 45 ponds and has speed too. This dog I asked for was to be a middle of the pack pup, not a wall flower not a alpha easy to train. And well Ron, you hit it right on the head She is fitting well into my dream team. We will be doing halftime at the Chicago Bears Christmas Eve at Solder Stadium and I have no worries putting her on the field. She is a show stopper! What with Zeke the Wonderdog my Lab, Rally and Panda my retirement years look very bright as I have been building this team for that. In closing if someone knows what they want and tell Ron he can do a awesome job of giving you the talent. Make no mistake about it Ron’s McNabs have the talent, but they do have a need to be worked, They are McNab Tough and above all else they are True Working Dogs. Over many years now I have chatted with Ron about the McNab Shepherd. This last summer I had a chance to meet him. We purchased a female pup out of Kye and Maddie from Ron and couldn’t be happier. She is keen to herd, super smart, and easily trained. Everything I had hoped for. A true McNab. We purchased a red male McNab, from Ron Prentice, from a litter born in July of 2017. We named him Brick. We learned of Ron’s dogs through a mutual friend who also purchased a puppy from the same litter for her daughter, Julia. We have been amazed and impressed with the breed in general and our puppy in particular! Here are some of the things that we are so impressed by. Ron has been great to deal with. He kept us informed every step of the way, sending us pictures after the puppies were born and throughout their infancy. He’s kept in touch with us, ready to answer any questions we may have, and is interested in how Brick is doing in his new home. The consistency among the litter. We stay in contact with his litter mates and they are very similar in size, markings and temperament. And from what I see in pictures of other litter mates, this holds true across the litter of 7. While puppies are always challenging, Brick has been an absolute joy to be around and raise. 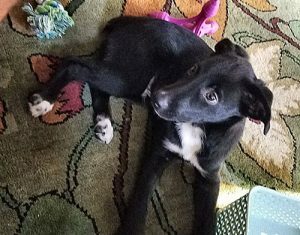 He is smart, energetic, and friendly to other dogs and strangers. We enrolled him in classes right after getting him. He is fearless when encountering new objects and surfaces and he thinks through new training activities, very rarely becoming frustrated. 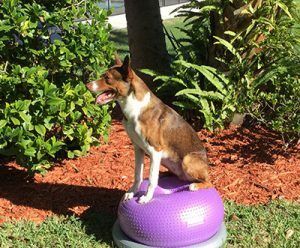 In addition to being a household pet, we plan on competing with Brick in disc and agility, and we’re confident he will excel at both. After owning large dog breeds with health problems for 30 years, I decided to explore different breeds. I had the good fortune to meet a number of McNab Shepherds in a variety of different situations which gave me a great opportunity to evaluate them as a potential new family member. I remember how impressed I was with the very first McNab I met. I pretty much knew from that moment that I was going to adopt a McNab. Fast forward a few years until when it was time to get a McNab. I did my research and was fortunate to find Ron Prentice and Rockin’ KR McNabs. Actually, it wasn’t all that difficult to find him because of his long and outstanding reputation in the McNab Shepherd community. Ron was very kind and professional every step of the way. He and his wife Mickey sent me photos within hours of the puppy’s birth and frequently thereafter. I named the puppy Finley. He is so sweet and smart and seems to intuitively know what I want him to do next. Finley is a great companion as well as a watchful guard dog. I hope to train him in agility, disc and nose work, partially because I know he will love it. I was exceedingly happy with every aspect of my experience with Ron. My favorite thing though is how deeply he cares for his dogs and the welfare of every puppy in each litter. 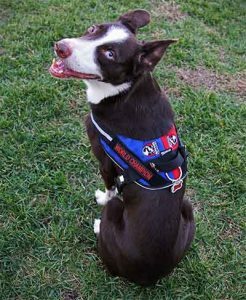 This translates to what I would like to call “Super Dogs” who are sweet in nature but highly focused and tenacious when it comes to herding or sporting activities. You couldn’t ask for a better dog or a better dog breeder. Actually, I don’t really like to call Ron a dog breeder — I think of him as more of a dog lover who breeds great dogs!